Heat oven to 350°F. Line 13x9-inch pan with foil, extending foil over 2 sides of pan. In large bowl, break up cookie dough. Stir or knead in flour, cinnamon and nutmeg until well blended. Press dough evenly in bottom of pan. Bake 18 to 20 minutes or until edges are golden brown. Cool completely, about 30 minutes. Remove cookie from pan by lifting foil; remove foil. Trim 1/2 inch from each short side of cookie. Cut cookie in half lengthwise. Cut each long strip into 3/4-inch-wide strips, making a total of 26 strips. From 1 end of each strip, cut off corners to form "pencil point." Discard corner pieces. Place "pencils," bottom side up, 1/2 inch apart on cooling rack over sheet of waxed paper. In small microwavable bowl, mix frosting and food color until well blended. Microwave uncovered on High 30 to 40 seconds or until frosting is melted and can be stirred smooth. 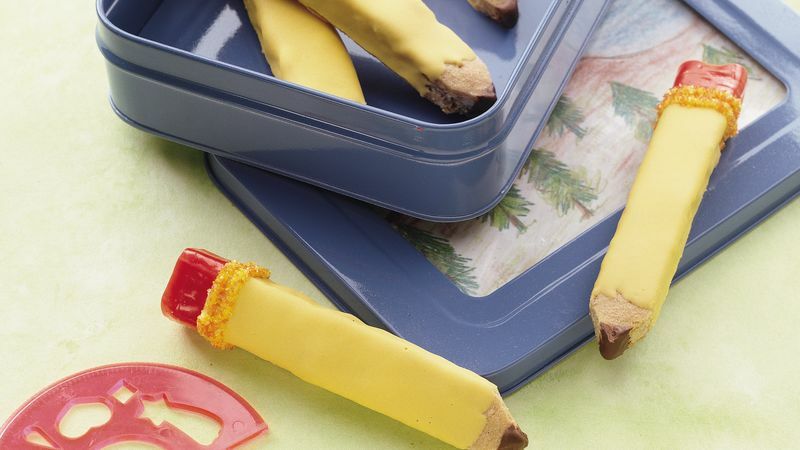 Spoon frosting over "pencils," leaving "points" unfrosted and allowing frosting to drip down sides. If desired, smooth sides with knife. Cut fruit snack rolls into 26 (1 1/2-inch) strips. Save any remaining fruit snack for another use. At end of each "pencil," place 1 strip on top and down sides of "pencil" to form "eraser." Sprinkle glitter below "eraser" to look like "metal band." Cool until frosting is set, at least 30 minutes. In another small microwavable bowl, place chocolate chips and oil. Microwave uncovered on High 45 to 60 seconds or until chocolate can be stirred smooth. Dip "pencil points" in melted chocolate to look like "lead." Cool until chocolate is set, about 15 minutes.